Another very fruit-filled box this week! 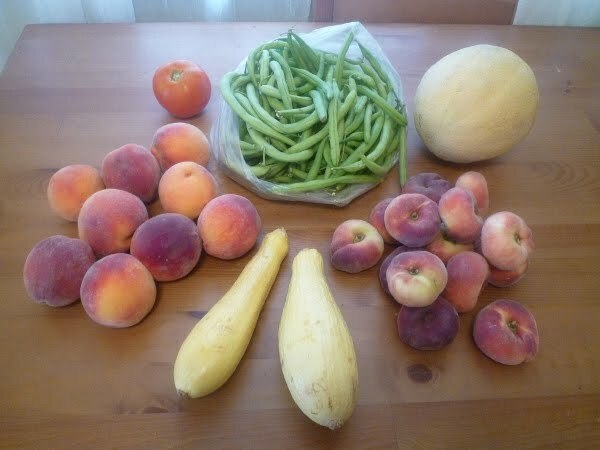 Here we have a tomato, melon, doughnut peaches, freestone peaches, green beans, and summer squash. I made a great little dish out of the tomato, green beans and squash sauteed with hot peppers, garlic, and onions. Topped a bowl of it with a slice of provolone and let it melt. One of the best vegetarian meals I’ve had in awhile. Nice and simple too for these dog days of summer. It hit triple digits here over the weekend and of course our air conditioning decided to die. Fortunately, it was after I finished baking an assortment of 6 dozen cookies for co-workers (mine and Joe’s) because, well, who doesn’t like homemade baked good surprises? 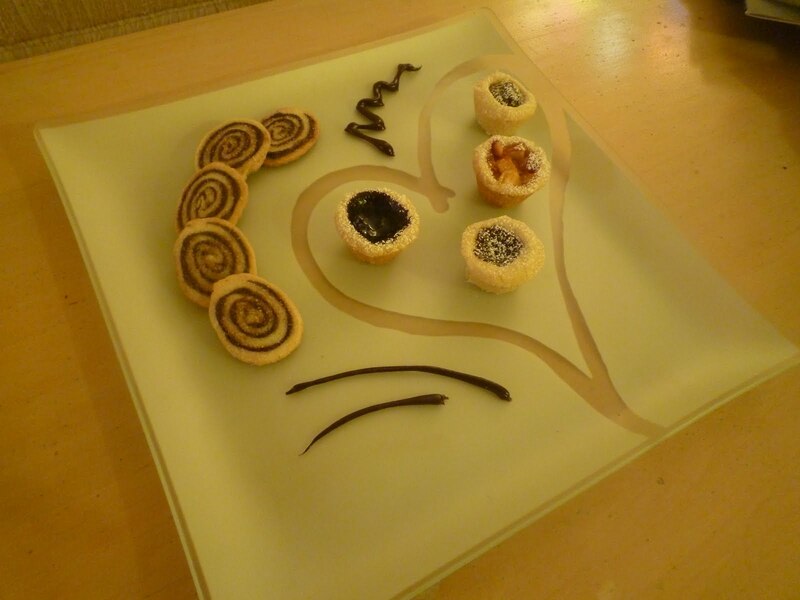 Here’s the sampler plate…I had leftover chocolate ganache in a ziploc bag and decided to do a little art project. One knows that it must be unbearably hot outside when, aside from a lone box of Italian ice, the grocery store is entirely sold out of popsicles and sorbet. Thus was my experience on Tuesday evening. There was still an array of ice cream on the shelf, but I wasn’t really in the mood. I wanted something refreshing, cool, and fruity.Well, if you want something done you’ve got to do it yourself sometimes. I’m seriously disappointed that I couldn’t get a good picture of the final dish, because it was absolutely out of this world. –Combine the sugar, water, salt, and lemon juice in a small saucepan and slowly bring to a boil. -Add the basil leaves and boil for 10 minutes or until slightly syrupy. -Combine the peaches and basil syrup in a blender and process until smooth. -Churn in an electric ice cream maker for about 20 minutes and then transfer to a freezer safe container and chill. -Whip the cream, vanilla, and sugar until soft peaks are formed. -To serve, place a scoop of the sorbet on a plate, top with a spoonful of preserves and a spoonful of the whipped cream. Garnish with more torn basil if desired. It is a really wonderful summer dessert with all of those components, but that’s only if you can keep yourself from eating the sorbet straight out of the freezer. It’s a challenge.